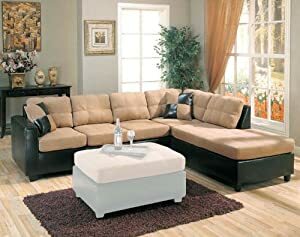 Soft, yet durable, the microfiber seat and back cushions rest on a dark brown faux leather base creating a delightful two-tone effect. Accent pillows feature complementary tones add to the dynamic look. Add more elegance to your home with this wonderful sectional sofa!